Contrary to popular belief, badminton is not just a backyard game. In fact, it became an Olympic sport starting with the 1992 Barcelona Olympics. Badminton is considered the fastest racquet sport in the world. Played with slender racquets and a cork wrapped with sticking goose feathers as its ball (known as a shuttlecock or birdie) it is said that the best player could hit the shuttlecock and send it flying at a speed of up to 200 mph. In tennis, the fastest recorded speed of the ball is at 155 mph, in a serve by American Andy Roddick during the 2004 Davis Cup. Games employing shuttlecocks have been played for centuries across Eurasia but the modern game of badminton developed in the mid-19th century among the British as a variant of the earlier game of battledore and shuttlecock. (“Battledore” was an older term for “racquet”.) Its exact origin remains obscure. The name derives from the Duke of Beaufort’s Badminton House in Gloucestershire, but why or when remains unclear. As early as 1860, a London toy dealer named Isaac Spratt published a booklet titled Badminton Battledore—A New Game but unfortunately no copy has survived. An 1863 article in The Cornhill Magazine describes badminton as “battledore and shuttlecock played with sides, across a string suspended some five feet from the ground”. The game may have originally developed among expatriate officers in British India, where it was very popular by the 1870s. Ball badminton, a form of the game played with a wool ball instead of a shuttlecock, was being played in Thanjavur as early as the 1850s and was at first played interchangeably with badminton by the British, the woollen ball being preferred in windy or wet weather. Early on, the game was also known as Poona or Poonah after the garrison town of Pune, where it was particularly popular and where the first rules for the game were drawn up in 1873. By 1875, returning officers had started a badminton club in Folkestone. Initially, the sport was played with sides ranging from 1–4 players but it was quickly established that games between two or four competitors worked the best. The shuttlecocks were coated with India rubber and, in outdoor play, sometimes weighted with lead. Although the depth of the net was of no consequence, it was preferred that it should reach the ground. The sport was played under the Pune rules until 1887, when the J.H.E. Hart of the Bath Badminton Club drew up revised regulations. In 1890, Hart and Bagnel Wild again revised the rules. The Badminton Association of England published these rules in 1893 and officially launched the sport at a house called “Dunbar” in Portsmouth on 13 September. The BAE started the first badminton competition, the All England Open Badminton Championships for gentlemen’s doubles, ladies’ doubles, and mixed doubles, in 1899. Singles competitions were added in 1900 and an England—Ireland championship match appeared in 1904. The game of badminton is played by two opposing players (either singles or doubles like in tennis) over a 44 ft by 17 ft rectangular court, which is bounded by tramlines and divided on the middle by a 150 cm high net. It starts when one player serves by hitting the shuttlecock from below the level of the waistline with the objective of sending it diagonally to the opponent’s court. On the other side of the court where the shuttlecock is sent by the server is an opposing player, who must receive the serve by returning the shuttlecock back to the server’s court. The players then hit the shuttlecock back and forth until one of them misses, sends the shuttlecock outside the court or fails to send it over the net. The player who does not make a mistake earns a point. Generally, matches have three games at 21 points each, with the player winning the first two matches as the victor. When both opposing players earn 20 points, the first to get two points lead wins the match. In the event both sides get 29 points, the first to get 30 points wins. Recreational players make a variation of this by limiting the matches into two 21-point games only. When played by advanced or even intermediate players, the game of badminton can be really fast and intense. Unlike tennis, the shuttlecock must not land on the court which makes its flight from one side to the other very fast, especially when a smash shot is employed. One watching a game will see players doing a lot of turns, running, sudden change of direction or even jumping in getting at the shuttlecock. This means that a good player must have stamina, flexibility and agility. 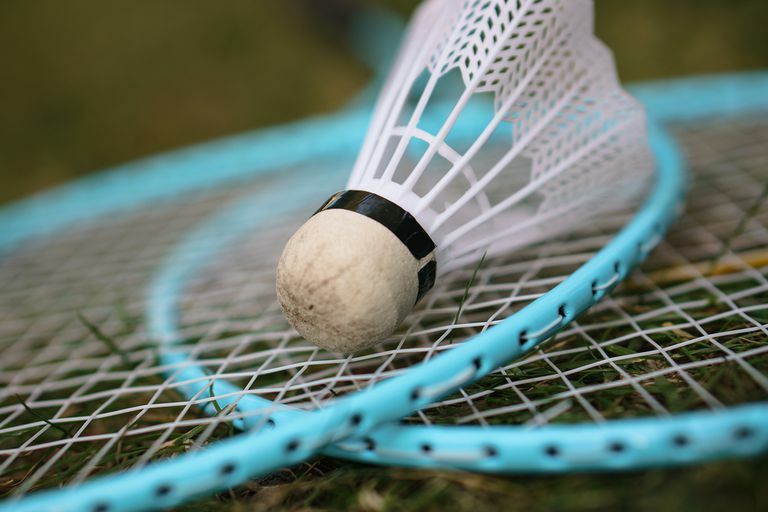 The basic equipment in badminton is the racquet. The racquet is light and slender and is made up of carbon fibre materials. In the past racquets were made of steel or even wood. Today steel or aluminum racquets are still being manufactured, but only few use them since they are heavy and not very effective in imparting force. The parts of a racquet are the handle or grip, the frame which is oval-shaped, and the shaft which connects the handle and frame. Inside the frame are criss-crossing strings. This portion is called the string bed, where the shuttlecock makes contact. The tightness of the strings (called tension) is measured in pounds, which ranges from 22 to 36 pounds. Like in most sports special shoes are used in badminton for performance and avoidance of injuries. Since badminton is played indoor, non-marking gum-soled shoes are used so as not to mess up the court floor and prevent slips. The ideal shoes should be light, not have high heels, have good ankle support and cushioning – to prevent ankle sprains, heel pains and allow for better movement. Clear- the shuttlecock is hit overhead and sent in a high ark to the back of the opponent’s court. Smash – the shuttlecock is hit overhead and sent toward the opponent’s court in a steep downward trajectory. Drop – the hitting motion is somewhat similar to a smash but is less forceful and the shuttlecock’s downward trajectory is not as straight and fast as in a smash. Drive – the shuttlecock is sent toward the opponent’s court in a flat or horizontal trajectory. Net – the shuttlecock is hit near the net gently to send it just over the other side of the net. Underhand – the shuttlecock is hit below the level of the net and is usually characterized by a lifting or scooping motion. Badminton is fun, affordable and appropriate for most ages. It is an enjoyable way of getting a sweat and takes away the drudgery of a monotonous and taxing exercise. But to get its full benefit it is advisable to learn the basics first by getting a trainer. Aside from avoiding bad habits as one progresses in the sport, a training is helpful in avoiding injuries by learning to execute the proper movements.